“Hayaseri” was a minor khanate (principality) of the former State of Dir in the North Western Frontier Province of Pakistan. It was ruled by Nawabzada Mohammad Shah (1941-1998), the Khan of Hayaseri (the youngest son of Nawab Mohammad Shah Jehan Khan, former ruler of the State of Dir, who died in captivity at Lahore in 1964. The Flag of Hayaseri was green in color. It had an elliptical circle in the centre with a wreath of leaves on both the sides. At the top of the circle was an inscription (the motto) in Arabic “Nasro Minallah-e-Wa Fathun Qareeb” (With the help of God the success is not afar). 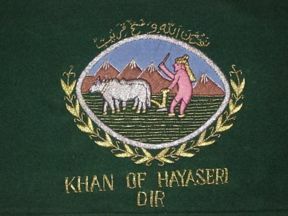 The personal flag (or Standard) of the ruler had words “KHAN OF HAYASERI – DIR” written below the central design. The central design in form of a landscape symbolized the importance of agriculture & the natural resources as mainstay for the local population. This flag at present is no more in official use as all the princely states in Pakistan has been abolished since 1969. However the descendants of the former ‘Khan of Hayaseri’ still use his personal flag (Standard) privately on their residences & cars as a link to their glorious past.